This light, summery dips’ main ingredient, pumpkin seeds, are high in zinc, selenium and vitamin E– a combo that makes them great for your skin. I adapted this recipe from one I saw in Food & Wine magazine, decreasing the amount of oil and sodium and switching to extra virgin olive oil for an omega boost. This dish is perfect for an appetizer to bring to a party when you want something that stands out, or just to have at home when your sick of hummus and bean dips. 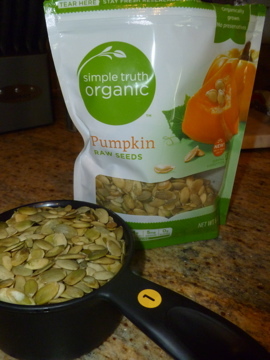 You can find shelled pumpkin seeds in the bulk bins at the grocery or in small packages like this one from Kroger (found in the organic section). 1. Toast the pumpkin seeds over medium heat in a large skillet for 5 minutes, tossing occasionally. Place seeds in a food processor. 2. In the same skillet, heat 1 tablespoon of olive oil and add shallots, jalapeno and garlic cloves. Place mixture in the food processor with the pumpkin seeds. 3. Add the parsley, cilantro, remaining tablespoon of olive oil, lime juice, orange zest and water to the food processor and puree until semi-smooth. Serve with tortilla or pita chips.